Hovering thousands of feet above the mountains somewhere in between my home in Baltimore and my parents home in Austin. That is my current location. Somewhere in between. I've never been my best in between. I'd much rather be here or there, starting or ending. You know that feeling in the pit of your tummy moments before speaking in front of a large crowd or kissing someone for the first time? Something really great is about to happen it just hasn't happened yet. Yes. I'd much rather be on the ground, feet planted firmly on the warm Austin pavement. I can't wait to eat my fair share of soft homemade tortillas, hike, run, explore, and cook with my father. I'm looking forward to being there instead of here, up in the clouds, thousands of feet above these beautiful cascading mountains. While I hover in a happy state of vacation anticipation, let's talk quinoa. I'm always surprised to learn not everyone has discovered this wonderful little protein packed grain yet. It is a staple in our home because it cooks quickly, tastes nutty, and is great with just about anything. BLT quinoa risotto, a fun take on two classic dishes, will whisk you just outside of your comfort zone. 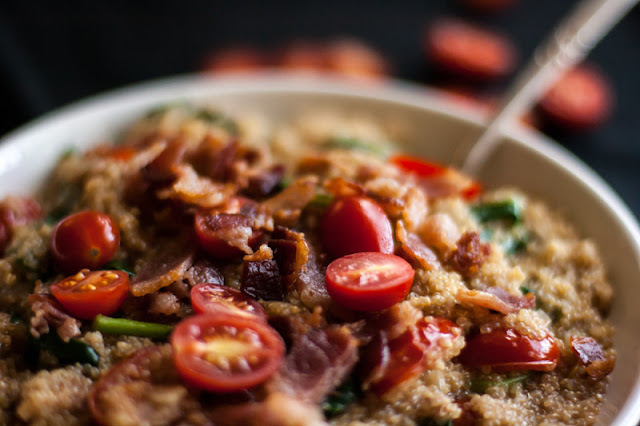 Crispy bacon, wilted greens and fresh bursts of tomato enliven this creamy risotto-style quinoa. Put this in your mouth. It will thank you. In a large heavy pot on medium heat, render bacon until crispy; about 5 minutes. Remove bacon and drain on a paper towel. In about 1 tablespoon of the bacon drippings cook diced onions, thyme, and garlic until translucent; about 5 minutes. Add quinoa, stirring to gently toast the grains; about 2 minutes. Add wine, pinch of salt and pepper, and stir until it is reduced; about two minutes. Add 1 cup of stock at a tie, stirring and allowing each cup of water to absorb in to the quinoa before adding another cup. Repeat until quinoa is tender remembering to stir often for a creamy texture. When adding the last cup of broth, stir in greens and heat through; about 3 minutes. Turn down heat to low. Stir in dijon, nutritional yeast ( or parmesan), cherry tomatoes and reserved crumbled bacon; stir until combined. Salt and pepper to taste. Serve immediately. Homemade limoncello, BLT risotto... I really am going to come crash your house. Looks so good-) Well done, this recipe is a winner! You've just blown my mind. Wow! I am in a state of delightful anticipation. This is on my menu in the coming week. Enjoy your vacation and those homemade tortillas! I love Austin--it's been way too long since I've been there. Have a great trip! This risotto looks divine--creamy and so flavorful.